Give your fairy princess theme party or event some ?Once Upon a Time? charisma with our crystal pumpkin coach favors! 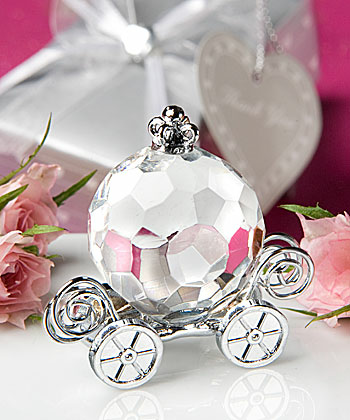 Whether you're planning a fairy tale wedding, Sweet 16, prom or any event with storybook appeal, these exquisite favors really enhance the Cinderella party theme charm. 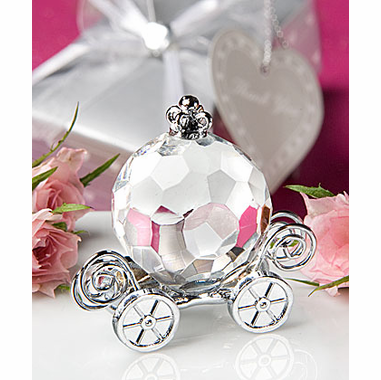 Each measures 1.5 x 1.5 inches and features a stunning multifaceted clear crystal pumpkin coach majestically perched on silver color metal wheels and carriage. Sure to enchant your guests long before the clock strikes midnight, these favors make for a stunning presentation inside a silver box decorated with white hearts, wrapped with a white organza and satin bow with a crystal heart accent on top and an attached heart shaped, matching design "For You" tag.